The underpinnings for Bridge-in-a-Backpack spans are composite tubes filled with concrete that are long lasting and corrosion resistant. One of the nation’s greatest challenges is our aging transportation infrastructure. A meaningful percentage of our nation’s bridges are either load posted due to limited structural capacity, or they cannot accommodate current traffic volumes. New technologies are critical to replacing this deficient infrastructure with lower-maintenance and longer-lasting products compared to traditional construction methods. The University of Maine and Advanced Infrastructure Technologies (AIT Bridges) have a construction product that is highly resistant to the harsh corrosive environmental elements that have caused the decay of our country’s transportation infrastructure. This product, known as Bridge-in-a-Backpack, was engineered for simplified construction and rapid replacement of small- to medium-sized bridges, culverts and overpasses. Past installations have taken as little as two weeks to complete. 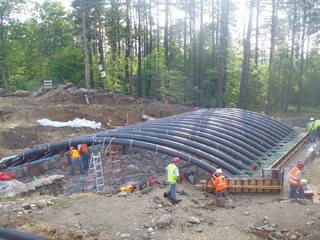 This large culvert replacement project in Fitchburg, Mass., required no heavy machinery. Arch placement and filling were done by hand in one day. Implemented into an accelerated bridge construction program, a Bridge-in-a-Backpack can reduce traffic congestion and help shorten lengthy construction schedules. After final engineering design is complete, manufacture and shipment can occur in less than 30 days. The bridge package was first successfully used in 2008 with the Maine Department of Transportation. Since then, nine more bridges have been built in Maine, Massachusetts and New Hampshire, with another planned next year in Michigan. Bridge-in-a-Backpack is a lightweight, corrosion-resistant construction technology using carbon fiber and advanced polymers to form composite arches that serve as the main structural supports for a cast-in-place concrete bridge. The carbon-fiber composite provides external reinforcement to protect and strengthen the concrete structure for increased durability, eliminating the need for steel rebar in the girders. 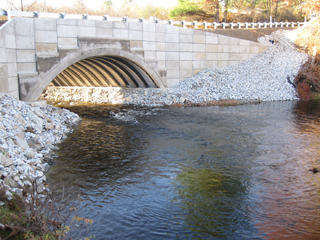 A Bridge-in-a-Backpack built over the Royal River in Maine won a 2011 ACEC Grand Award for Engineering Excellence. Carbon-fiber composite provides external reinforcement to protect and strengthen the concrete structure of the bridge over the Royal River. The technology received its name from the relative portability of its input materials. According to creator Dr. Habib Dagher, director of the University of Maine-based AEWC Advanced Structures and Composites Center, the materials used to produce the arches could be rolled up to fit inside a backpack. The product was developed over nine years at the University of Maine and is being commercialized by AIT Bridges. The structural redundancy and predictable performance of this bridge ensures long-term safety while extensive laboratory testing confirms that the technology exceeds bridge and building code requirements. 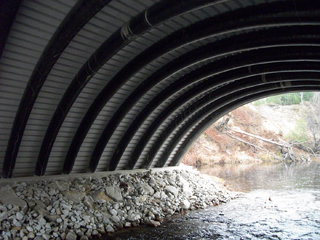 AIT Bridges are custom designed according to specific site conditions and needs. Each arch is typically a tube of 12 or 15 inches in diameter, and can be up to 75 feet in length. Arches begin as sleeves of braided glass and carbon fibers. The fiber sleeve is inflated to form a tube, which is then bent into an arch and infused with a durable resin to stiffen it into shape. Manufacturing takes just a few hours, producing a hollow arch tube that weighs less than 250 pounds. The arches are shipped hollow, eliminating the need for heavy equipment, cranes and large crews. Construction on site is very simple. 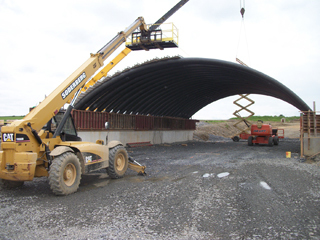 Each hollow arch can be placed with basic equipment or hand carried. Once set in the footers, the arches are covered with composite decking material and pumped full of concrete to form the main bridge supports. The custom-designed arches act as structural reinforcement and stay-in-place formwork. Bridge-in-a-Backpack can support numerous designs such as highly skewed geometries and single and multiple spans up to 75 feet over roadways, railways, valleys, gullies, water crossings and other obstacles requiring a bridge. The largest structure built to date is a 54-foot span in Caribou, Maine. The Maine DOT in July built this 54-foot-long, 55-foot-wide overpass using a Bridge-in-a-Backpack. One of the major benefits of the product is that AIT bridges are highly resistant to harsh corrosive environments. Prolonged exposure to road salts and sea spray is a major deterioration factor for bridges. Corroded steel reinforcement significantly reduces the load-carrying capacity of concrete bridges. With this design, a durable external reinforcement encases the concrete, strengthens it, and acts as a protective shell. This increases the bridge’s lifespan by keeping out harmful chemicals and moisture. The American Society of Civil Engineers this year awarded the Bridge-in-a-Backpack technology with the prestigious Charles Pankow Award for Innovation. Also this year, the American Council of Engineering Companies honored one Bridge-in-a-Backpack built in Maine with an Engineering Excellence Award. For these reasons, AASHTO’s Technology Implementation Group has selected the Bridge-in-a-Backpack as a 2011 Focus Technology. AASHTO says this technology offers advantages over traditional bridges in environmentally sensitive areas, such as fish passages, and in locations where it isn’t feasible to bring in heavy construction equipment, which also saves on shipping costs. Additional benefits are they can be less expensive over time with a reduced need for protective coatings, can last longer in severe environments, and produce a lower carbon footprint. Bridge-in-a-Backpack installations are gaining widespread acceptance throughout New England, with installations in three states and designs in five others. Priced competitively on a first-cost basis, with numerous life-cycle cost advantages, the use of Bridge-in-a-Backpack could lift the strain of our nation’s stressed transportation system while extending the lifespan of our future inventory. Barry L. Raeburn is chief operating officer of AIT Bridges, responsible for business and corporate development, government relations and overall growth of the company.